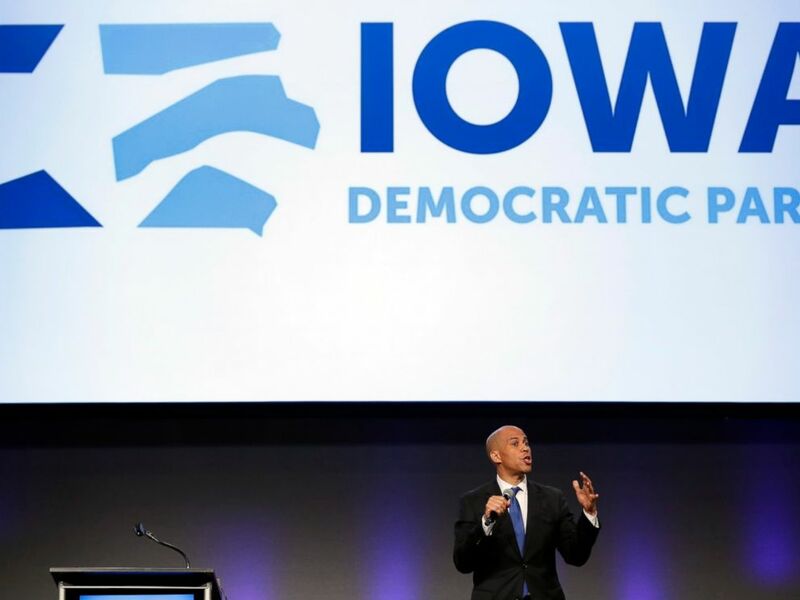 Sen. Cory Booker descended on Iowa Saturday night with ideal timing to strike a chord with Iowan Democrats. The senator from New Jersey, a long-rumored 2020 presidential candidate, arrived at the Iowa Democratic Party’s fall gala fresh off the Senate floor, where he voted not to confirm President Donald Trump’s embattled Supreme Court nominee Brett Kavanaugh. Kavanaugh, who has denied all allegations of sexual assault, was confirmed in the Senate -- an upsetting loss for Democratic voters who felt the decision sent a discouraging message to sexual assault survivors -- and the visit from a loud voice on the Senate Judiciary Committee offered some positive news for Democrats here. 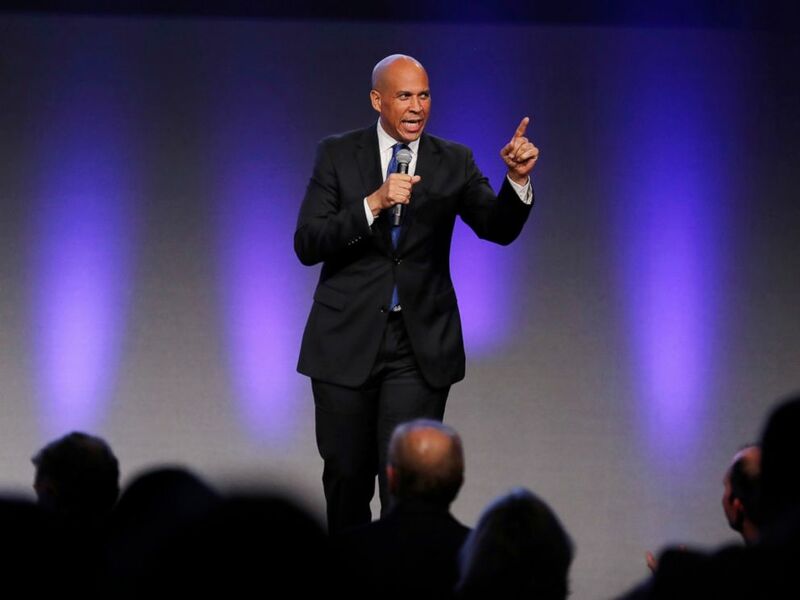 U.S. Sen. Cory Booker, D-N.J., speaks during the Iowa Democratic Party's annual Fall Gala, Saturday, Oct. 6, 2018, in Des Moines, Iowa. Lily Feiger, a 20-year-old college student in Des Moines, said she looked to Booker’s visit to Iowa for inspiration. “This whole thing feels like a therapy session and Sen. Booker is the therapist,” Feiger said of the gala. In passionate remarks that often had the room of Iowa Democrats on their feet, Booker answered the request, speaking of unity and encouraging voters to fight back. Booker, who serves on the Senate Judiciary Committee, showed the intensity at the Iowa fundraising gala Saturday that he showed during the hearings, when he had a self-described “Spartacus moment,” announcing he would release confidential documents from Kavanaugh’s time with the George W. Bush White House to the public. 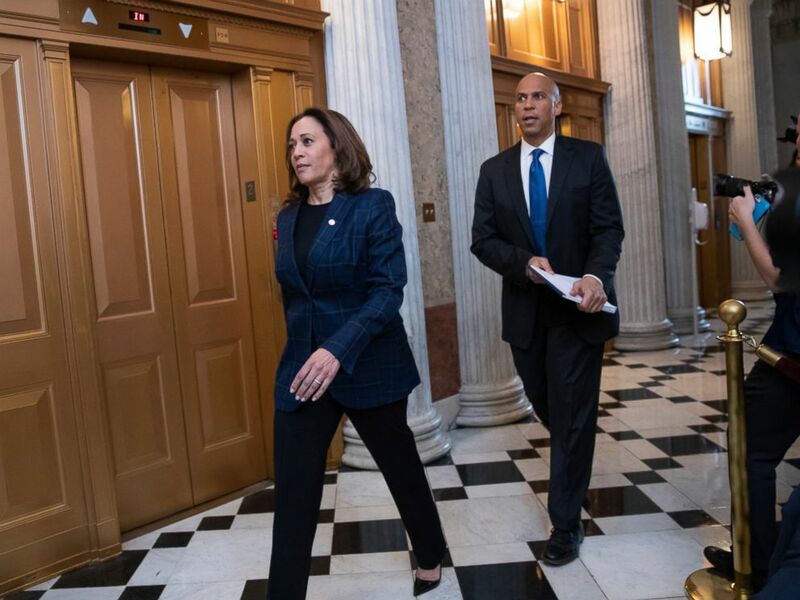 Senate Judiciary Committee members Sen. Kamala Harris, D-Calif., left, and Sen. Cory Booker, D-N.J., arrive at the chamber for the final vote to confirm Supreme Court nominee Brett Kavanaugh, at the Capitol in Washington, Saturday, Oct. 6, 2018. “Even in the face of defeat, we cannot be defeated. Even when we’re knocked down, we can never be knocked out,” Booker said Saturday. Despite the Democrats’ loss on the Supreme Court, which will now have a conservative majority, Booker’s eager welcome from Iowan Democrats was nothing short of a victory. Iowa wields unique presidential power with its caucus -- the first major presidential contest of an election cycle -- and Booker is one of the first high-profile candidates to headline a big event here. 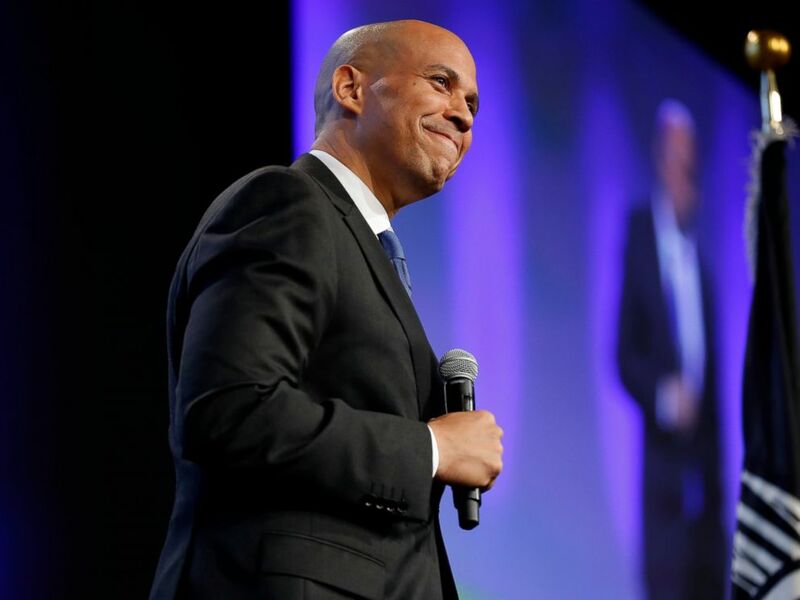 Booker's name has been in the mix of presidential candidates since 2016, even sparking a tweet from then-candidate Trump. In a recent profile by New York Magazine, Booker said he would "consider" the presidency. "It would be irresponsible not to,” he said. "Are you running?" a reporter asked Booker, who spoke to the press after the gala. "I do need to get in shape so I will probably go jogging here in Iowa in the morning," Booker joked. "No, in all seriousness we’re here to focus on the election coming up in 31 days." Booker also addressed Trump's comments at a rally in Kansas Saturday, where the president said voters shouldn't want Booker in office. "I will never let him pull me so low as to hate him," Booker said to reporters. "I'm gonna be -- continue to be a voice in this country for the love, for bringing the nation together, not driving the nation apart." In his speech, the senator criticized the president's response to allegations against Kavanaugh. The crowd in Des Moines stood, applauding Booker. And beyond the state capital, across the state, Kavanaugh’s nomination proved to be a galvanizing factor for Democrats already fueled by anger over the 2016 election. “I hope that this will energize women to vote, go to the polls, work for candidates that support women’s issues,” Gale said. About an hour away at Iowa State University, 21-year-old Cody Woodruff said protests and conversations about Kavanaugh were pervasive on campus over the last few weeks. At local Democratic events in Iowa, Woodruff often hears that the upcoming election is the “election of a lifetime,” he said. “But for a lot of Democrats, especially young people, deep in our bones we feel like, ‘Oh my God, 2016 was key and we lost,’” Woodruff continued. Woodruff called for more Democrats to join Booker in visiting Iowa. At the gala, both Feiger and her friend, Kamryn Ryan, also a 20-year-old student in Des Moines, also called for more Democrats to visit the state -- for all voters, but especially for women who are looking to Washington "to protect us." "In the time of the #MeToo movement, this just feels like a shutdown. It's a hard hit," said Ryan. Both Ryan and Feiger said they know sexual assault survivors: “Every woman has been through it or knows someone who has,” Ryan said. “Democrats just need to get out here and be that inspiration,” Ryan said.